I’m a big fan of yogurt, as anyone who has been reading my blog for a while knows. Because of that, I am always excited to do a review of any yogurt products. 🙂 I was sent a coupon and prize package from MyBlogSpark and Yoplait that gave me the opportunity to try one of Yoplait’s new “Splitz” yogurts. There was quite a selection of different GoGurt types for me to choose, but all had some things in common: 1) it’s marketed towards kids, and 2) it comes in a tube package instead of a cup. This lets you squeeze it into your mouth or freeze it and then eat it like a pop ice sort of desert. I chose to try the “simply…GoGurt” yogurt. It contains NO high fructose corn syrup, NO artifical colors, and NO artificial flavors. That’s a win for this mom! I only want to put natural, healthy food into my own and my kids’ mouths. It can be quite the challenge and particularly if you want to buy something that is marketed towards kids (why that is, I don’t know). We found that simply…GoGurt tastes good (although I wouldn’t mind if it was less sweet), looks good, and feels good in your mouth. Yup, that’s about all there is to it: it’s good. Now you can drive past your local sweet shop without looking back. Yoplait Splitz is the new yogurt that tastes like a sundae. Providing all of the goodness of 100% real yogurt, Yoplait Splitz is a good source of calcium and vitamin D. With no artificial flavors or sweeteners and no high fructose corn syrup, this 90 calorie dessert is the treat your family craves. For an even “cooler” experience, just pop a Yoplait Splitz in the freezer and in a few hours you can enjoy a cool, creamy cup of authentic frozen yogurt. Available in three delicious flavor combinations including Strawberry Sundae, Strawberry Banana Split, and Rainbow Sherbet, Yoplait Splitz is sure to have your family screaming for more. Visit http://www.myblogspark.com/uc/main/7b3a/ to download a printable coupon for $0.75 off any flavor Yoplait Splitz today! Win It! 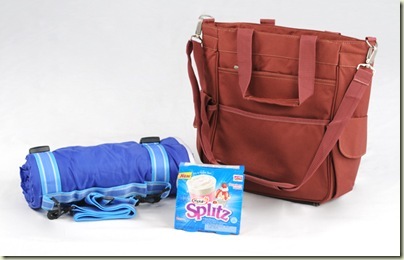 One lucky reader will receive the same prize package I described above: a coupon for a free box of Yoplait Splitz, as well as a sweet insulated picnic bag and blanket. To win, all you have to do is follow me through Google Friends/reader (be a Blogger follower) and leave me a comment telling me why you want this package. Make sure you leave an email address and separate comment for each entry! Contest will end September 6th at noon, EST. “Like” Yoplait on Facebook or Follow Yoplait on Twitter and let them know I sent you! One entry per tweet about this contest (max: 3 tweets per day, at least one hour apart): #win a Yoplait Prize Package worth $50 from @LifeMoreSimply ! Enter at http://tinyurl.com/2g6pytn. Note: this review is based on free products I received from MyBlogSpark and Yoplait. No other compensation was received and the opinions are mine. I follow you on Google Friend Connect and I want to win because I love your yogurt (and this yogurt looks like a fun one that my son would like to eat) and I love to go on picnics so the blanket and pack would be great to have! I like Life More Simply on FB. I follow you on blogger 🙂 I would like to win because anything that combines yogurt and dessert is a win for me! Following you through Google Friend Connect (furygirl3132). I would love to win this prize package because not only do I love yogurt and this really sounds good, but the picnic basket and blanket would really be great for the family and I to go to the park with. Thanks so much for hosting this giveaway!